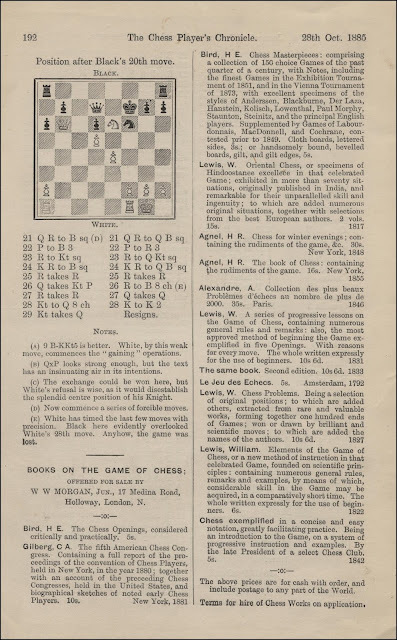 I referred recently to the number of books listed in Betts' Bibliography that had only partial chess content and below are two examples, with a further two books not recorded in Betts. 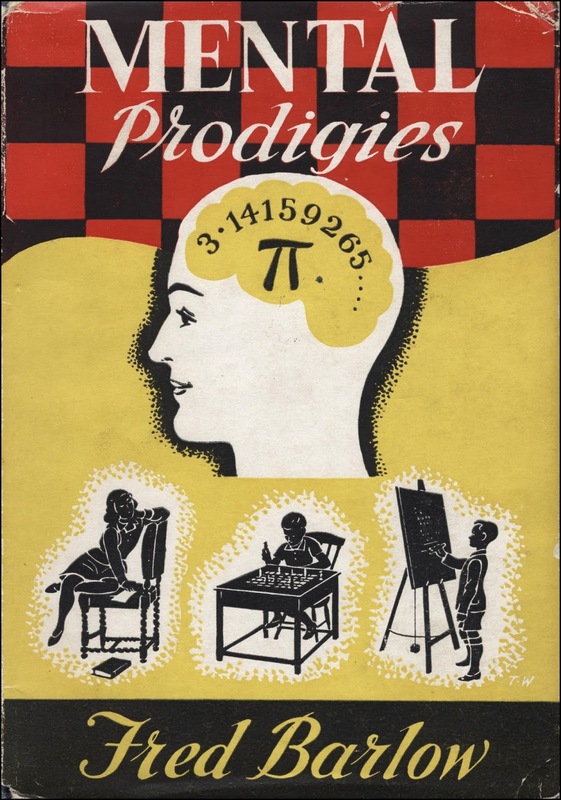 Mental Prodigies; An Enquiry into the Faculties of Arithmetical, Chess and Musical Prodigies...., by Fred Barlow, London 1951. This book claimed to be the first attempt to gather together particulars of those unusual people exhibiting certain curious mental abilities, and the Introduction promised "Investigations will not be confined to calculating prodigies. 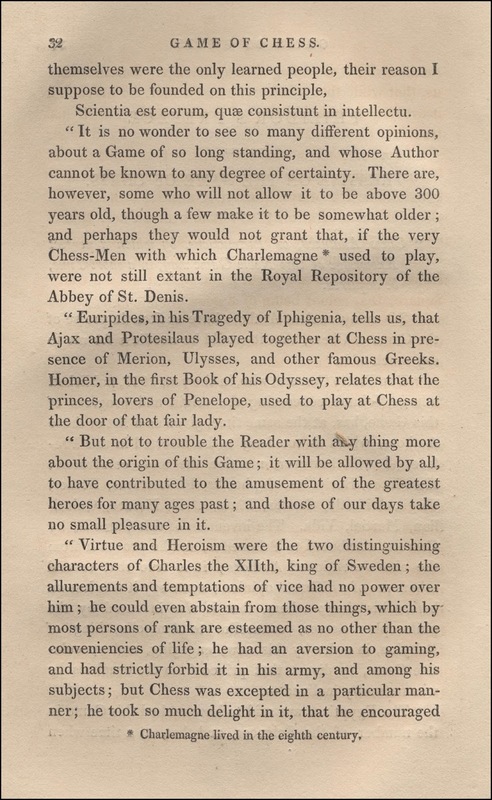 We shall want to devote some time to the study of associated subjects - in particular, to those persons possessing, to an unusual extent, the faculty of memory and also to musical and chess prodigies, men of genius, and precocious children." However, the very disappointing chapter on Chess Prodigies on pages 119 to 125 makes only the briefest reference to the prodigies Morphy and Capablanca. Barlow also refers to a Polish boy of about eleven years of age playing twenty simultaneous games with skilled players. 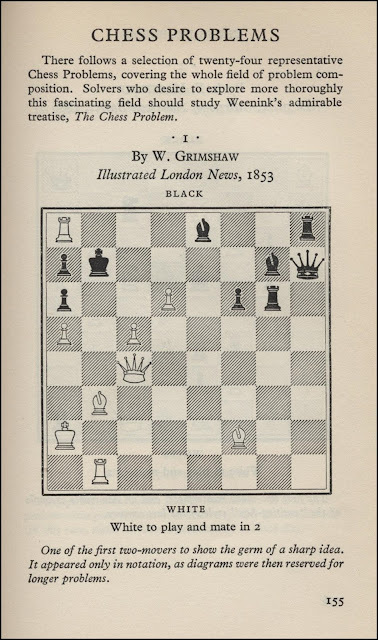 Obviously meaning Reshevsky but unable to recall his name. 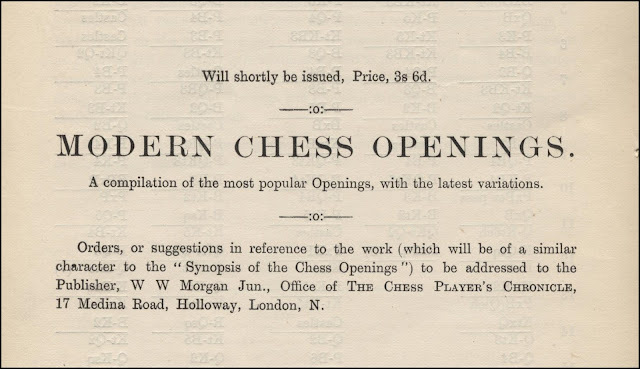 There are two brief mentions of Morphy, including this highly dubious claim "Morphy stated that of the many thousands of games he had played, after his chess powers were mature, he had not forgotten a single game. 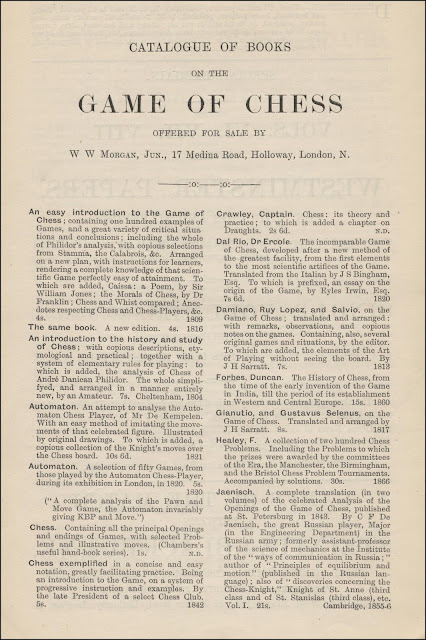 "; and this is all he had to say about Capablanca: "Jose Capablanca, chess champion of the world from 1921 - 27, started to play chess at the age of four." 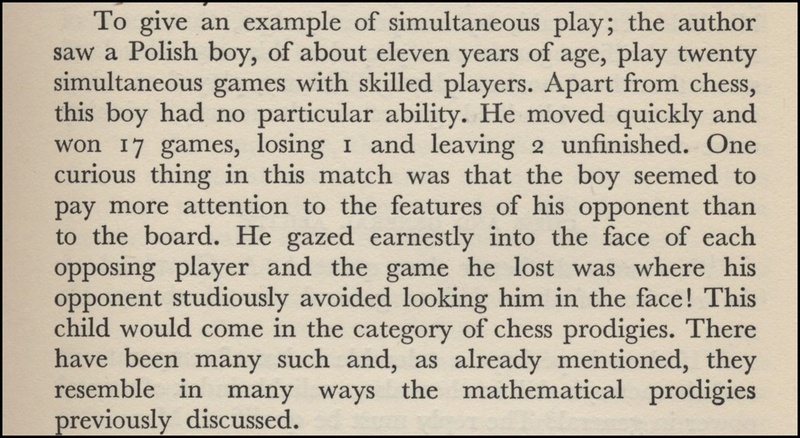 There is no mention of any other chess prodigies. 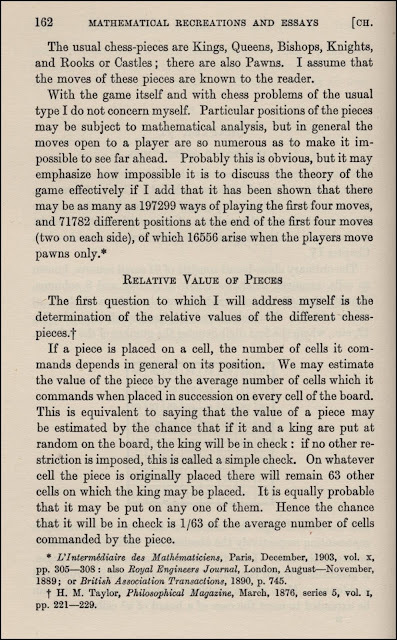 Much of the material in this chapter was taken from Alfred A. Cleveland's article The Psychology of Chess in The American Journal of Psychology, 1907. 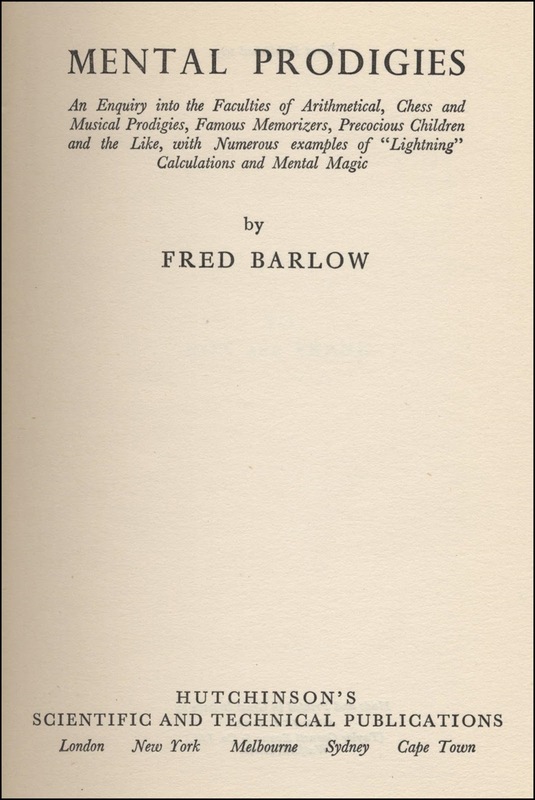 Barlow was the managing director of a Birmingham office equipment firm, and a member of The Magic Circle, The British Magical Society and The Society for Psychical Research. 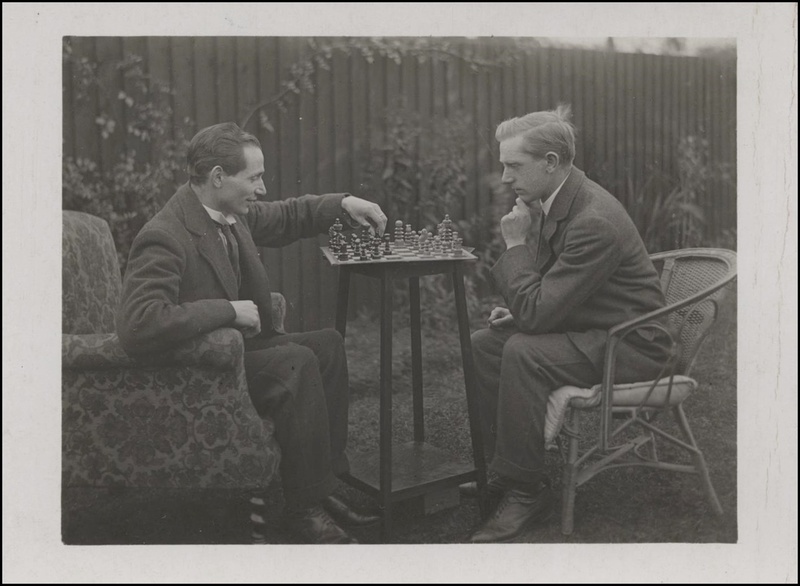 He was a keen chess player of average ability and here is a photo of him in play against Sidney Fincher - Barlow is on the right. 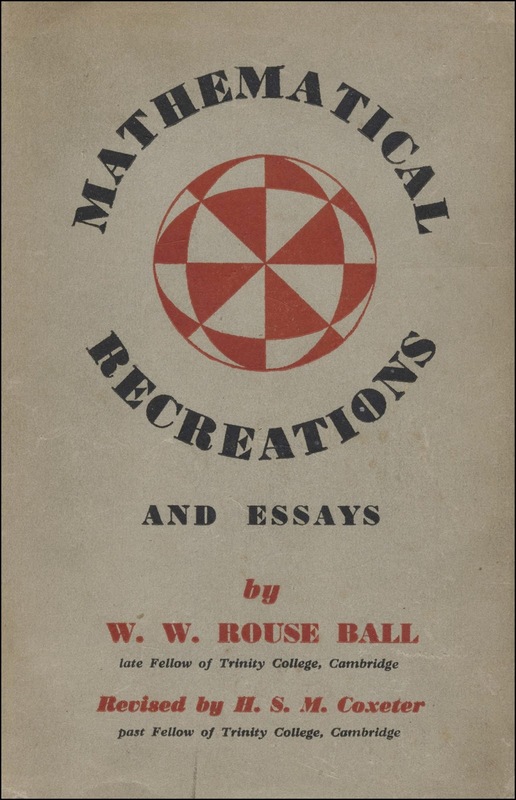 Mathematical Recreations and Essays by W. W. Rouse Ball, first published in London 1892 with many later editions and reprints. Rouse Ball's book is recorded in Betts at 41-2, 41-4, 41-5, and 41-8, and I am using the 1949 reprint of the 11th edition revised by H. S. M. Coxeter. 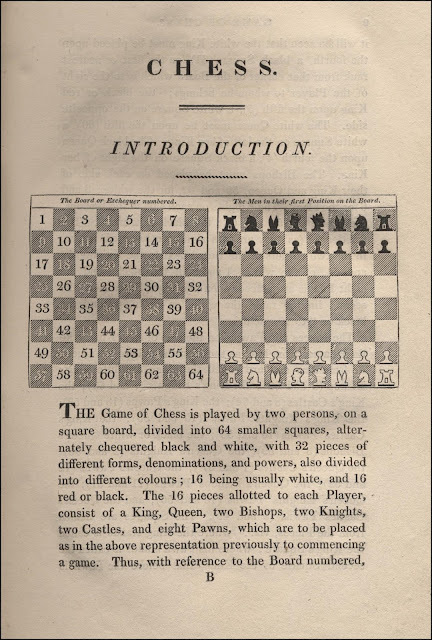 The book has various chess and chessboard related problems, starting with two problems concerning the re-arrangement of counters or pawns on a chessboard in the chapter on Geometrical Recreations on pages 122 to 125. 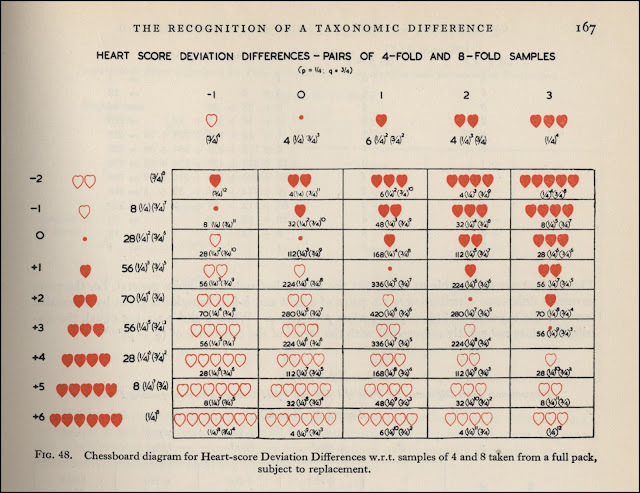 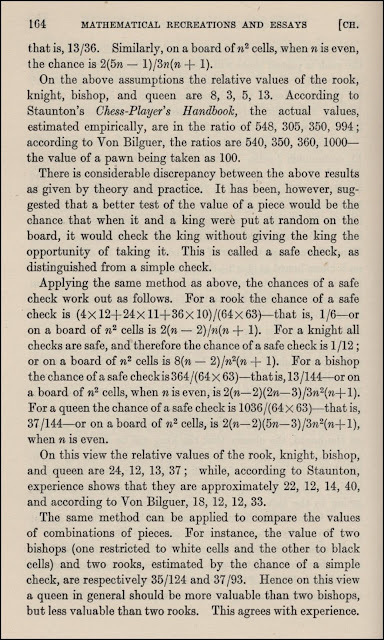 Chapter VI is entitled Chess-Board Recreations and the author starts by giving some mathematical calculations of the relative values of pieces, comparing his results to those of Staunton and von Bilguer. 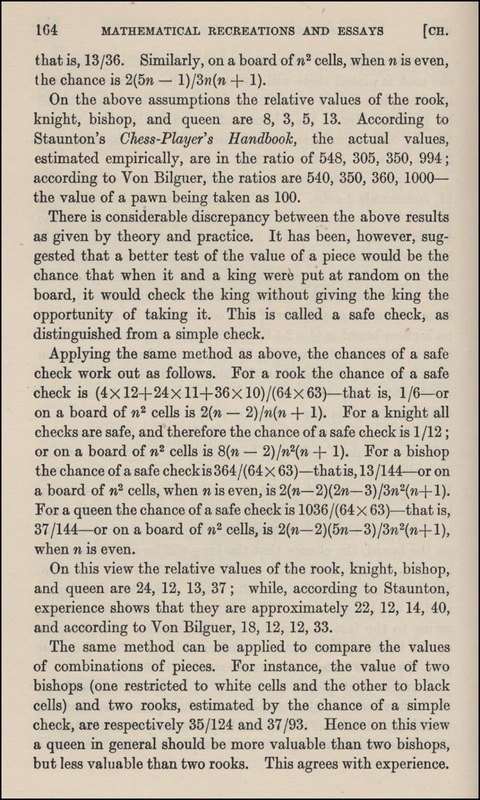 He then discusses the Eight Queens Problem, to determine the number of ways in which eight queens can be placed on a chess-board so that no queen can take any other, followed by the analogous Maximum Pieces Problem (finding the maximum number of kings, or any piece of one type, which can be put an a board so that no one can take any other) and the Minimum Pieces Problem (finding the minimum number of kings, or pieces of one type, required to command or occupy all cells). 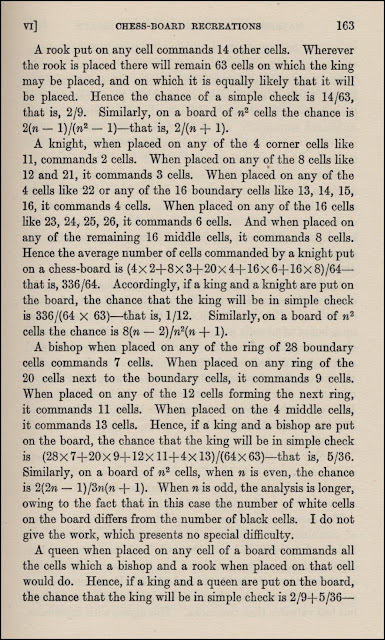 Rouse Ball then talks about Re-entrant Paths on a Chess-board commencing with a detailed discussion of the knights tour but also including re-entrant paths by kings, rooks and bishops. 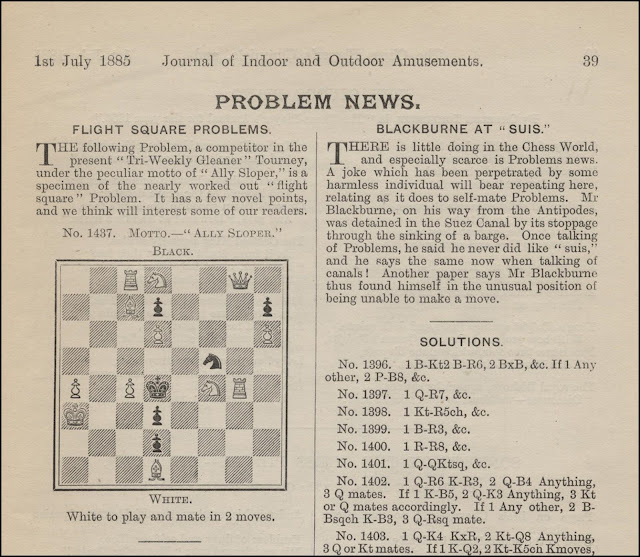 Various similar problems are also introduced. 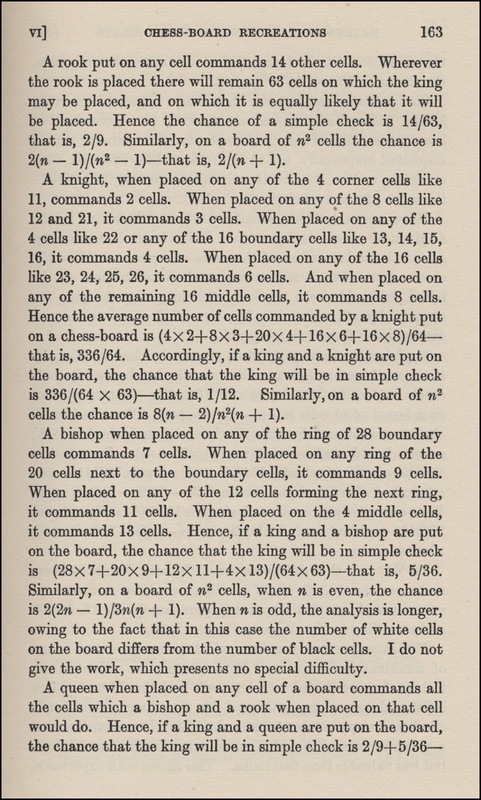 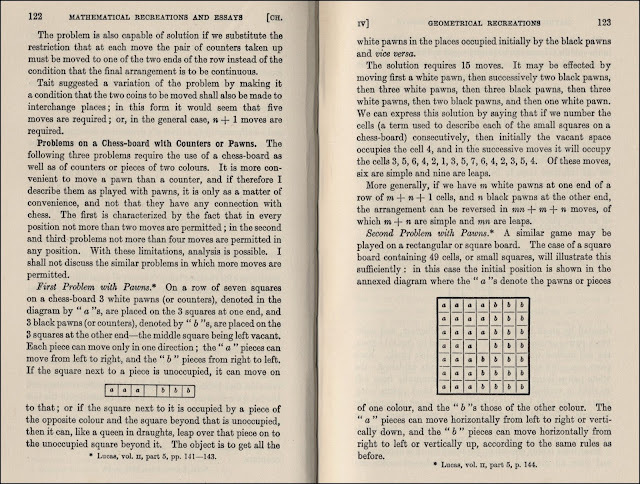 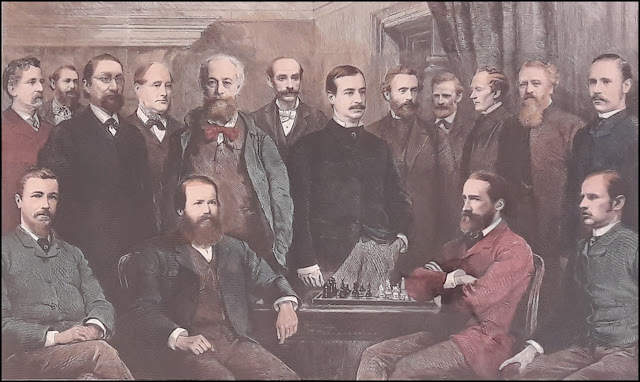 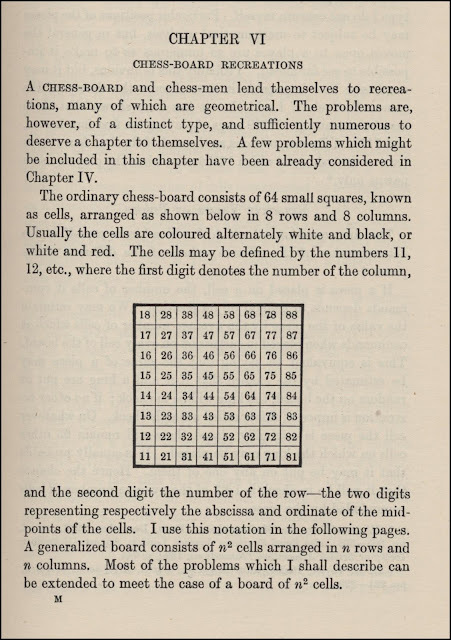 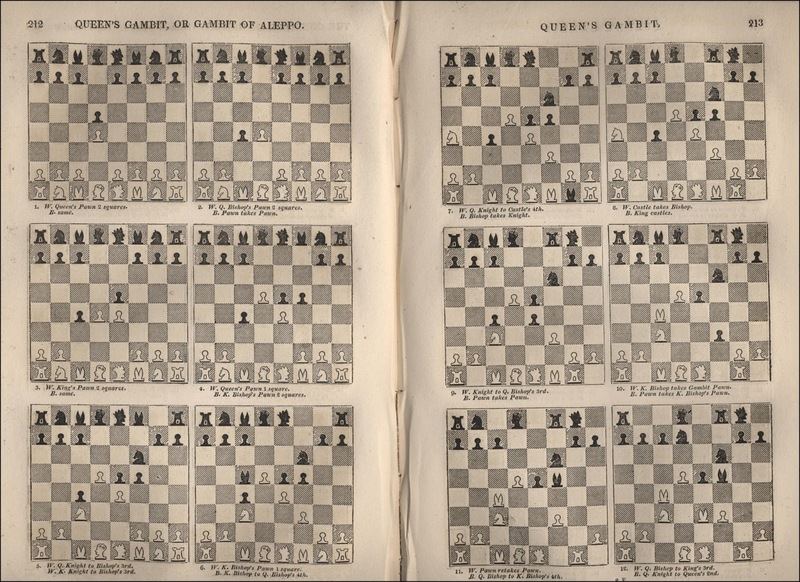 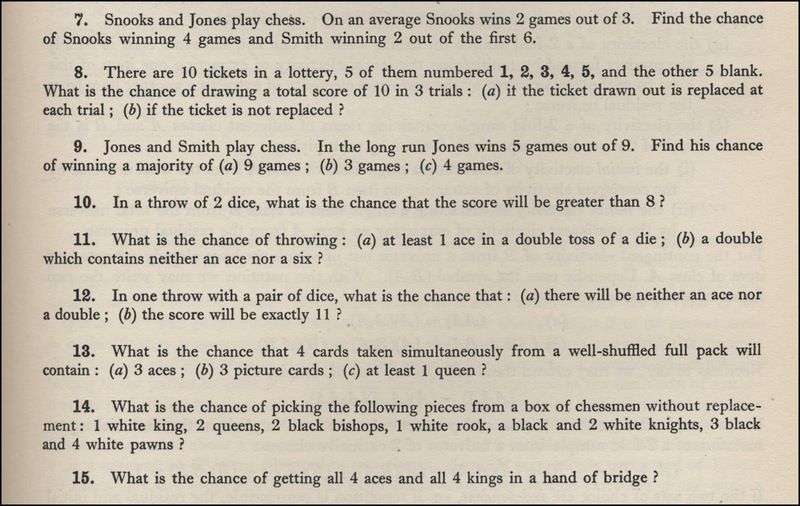 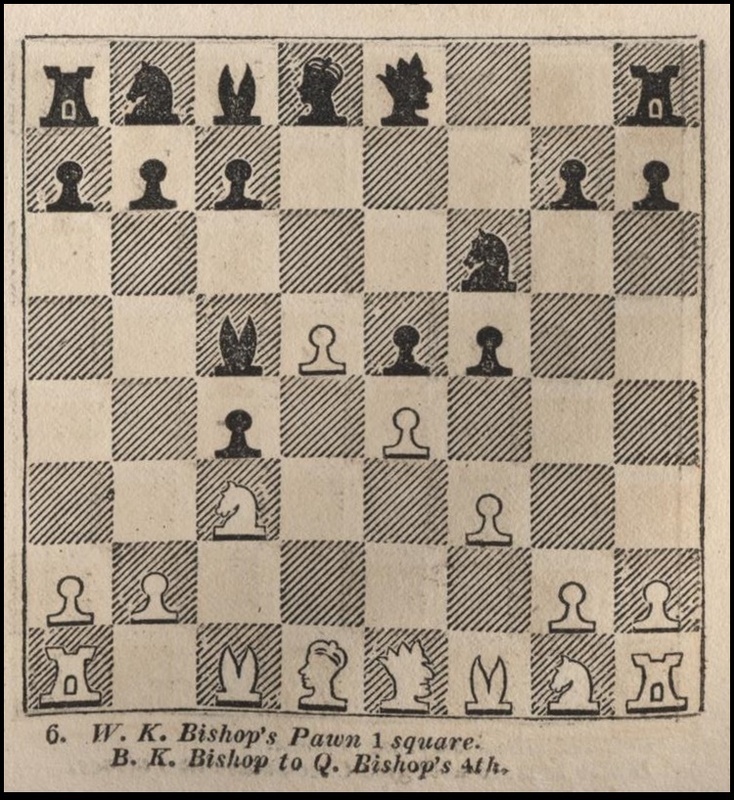 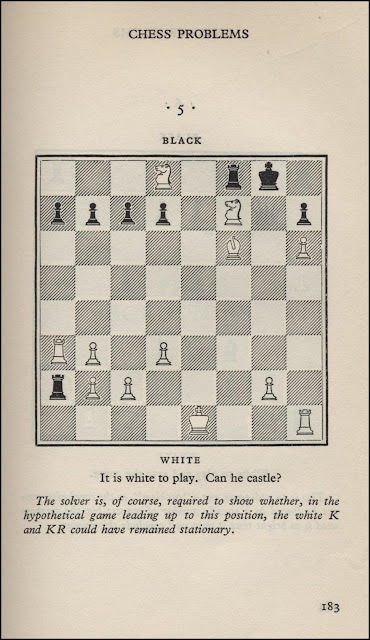 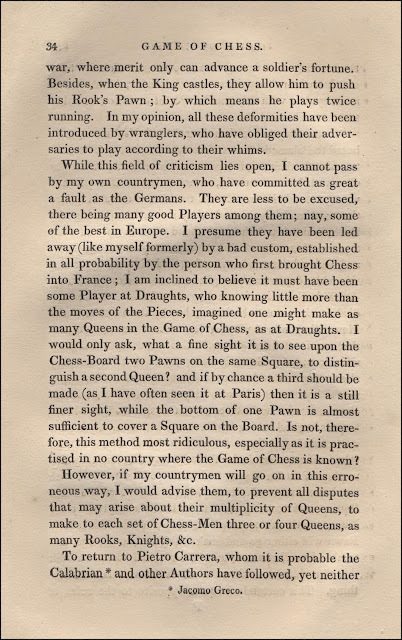 There are several references throughout this chapter to C. F. Jaenisch's Applications de L'Analyse Mathématique au Jeu des Échecs, Petrograd 1862, and a reference to Pratt's Studies of Chess, sixth edition 1825, in connection with the knights tour. The Week-End Problems Book compiled by Hubert Phillips, London 1932. 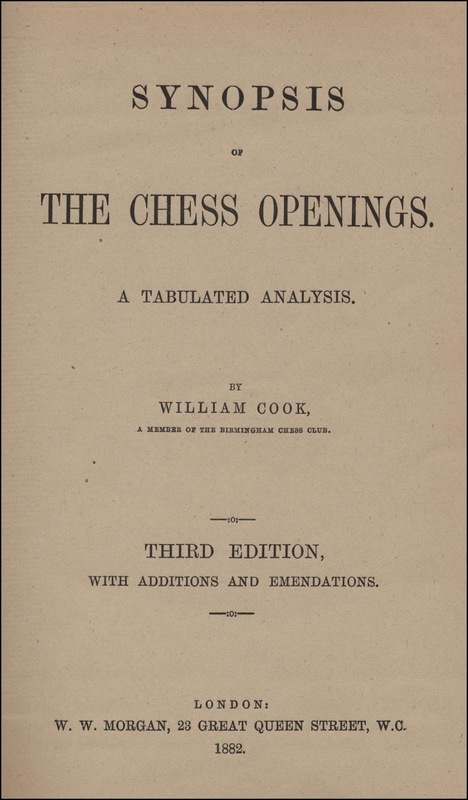 This book is not recorded in Betts but includes a Chess Problems section edited by Comins Mansfield. 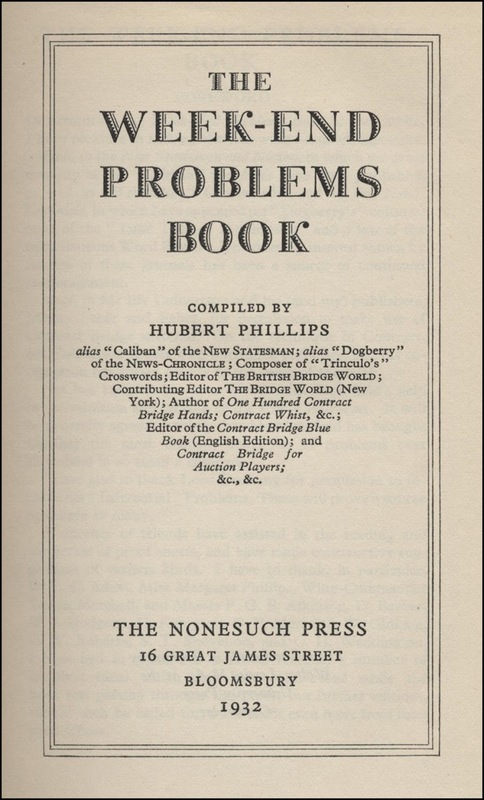 This includes 24 problems claiming to be "the most brilliant collection of problems ever assembled in so small a compass". 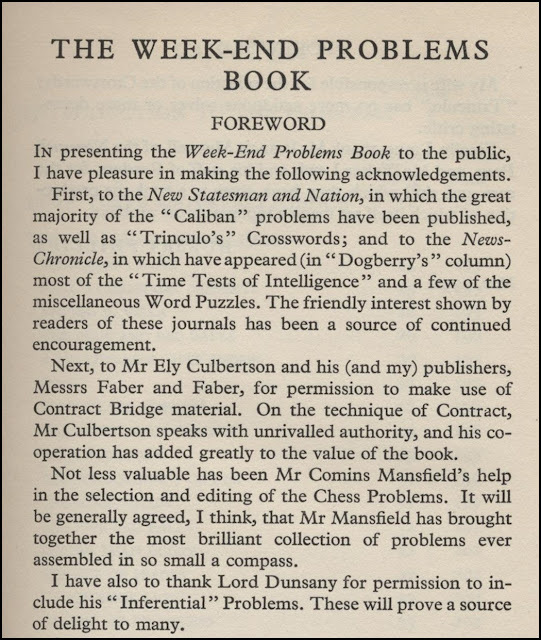 Also included are six Inferential Problems by Lord Dunsany with some very detailed solutions. 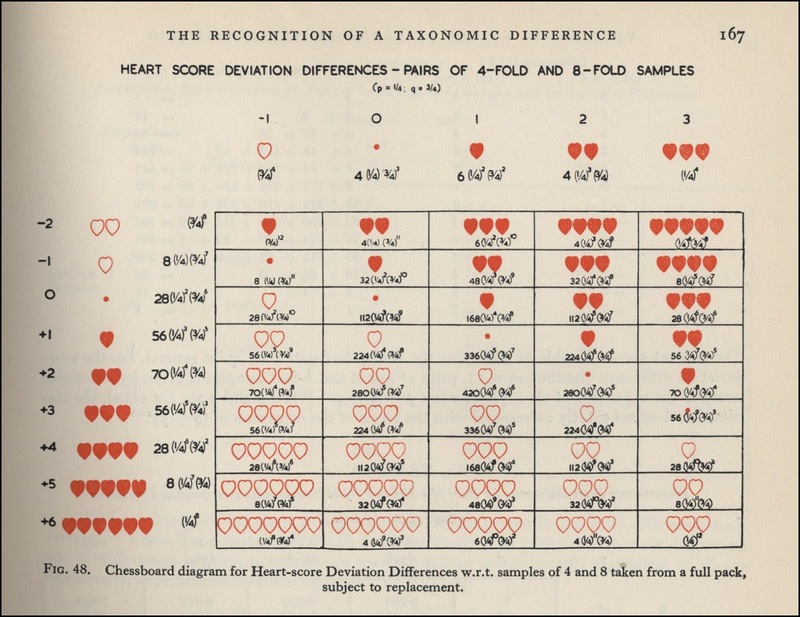 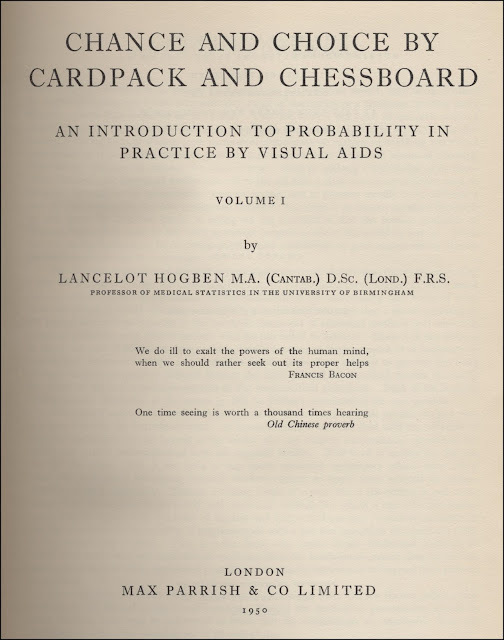 Chance and Choice by Cardpack and Chessboard by Lancelot Hogben, London 1950. 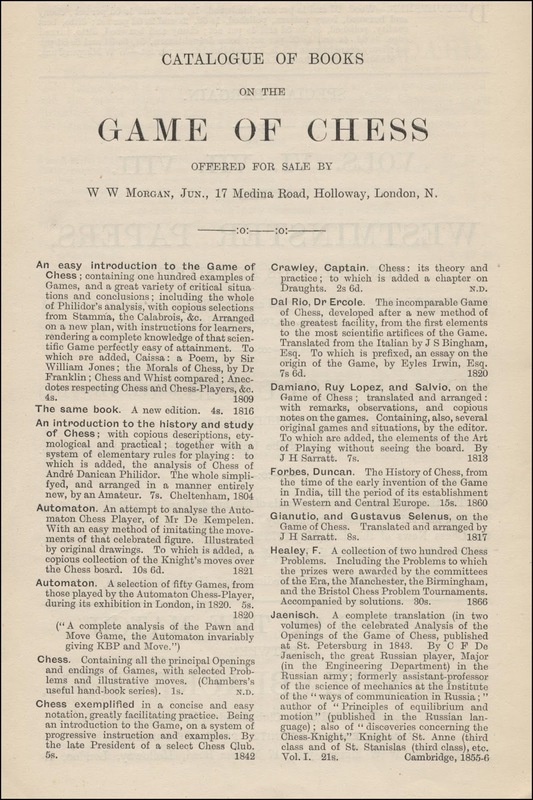 Collecting chess related pictures, illustrations and photographs goes hand-in-hand with chess book collecting, and here are four that I have bought this year. 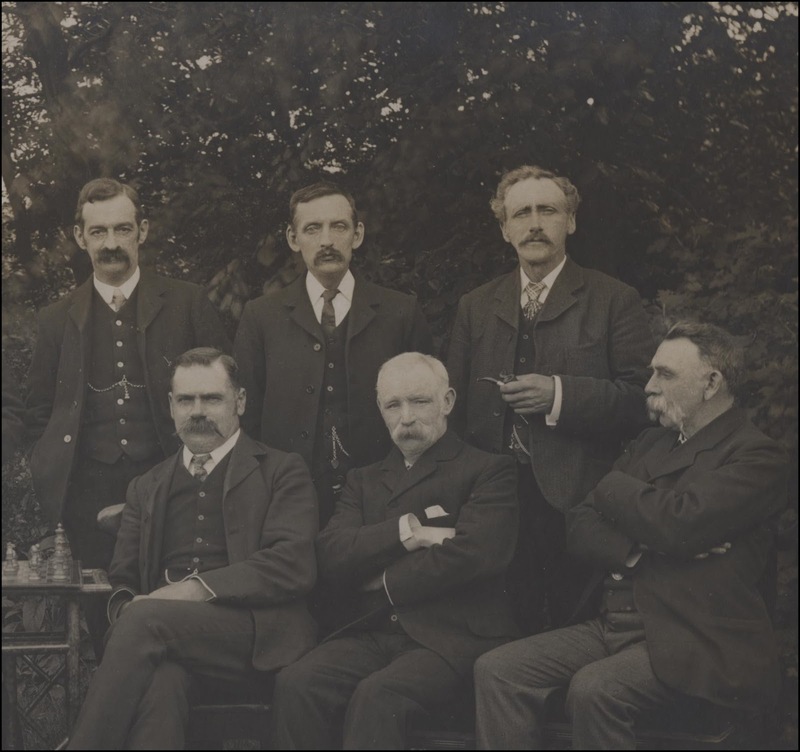 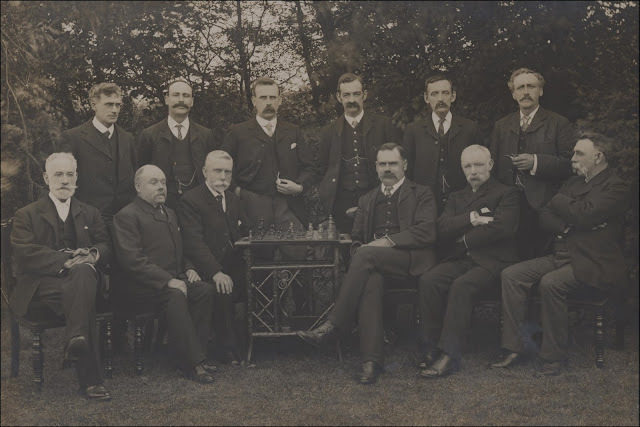 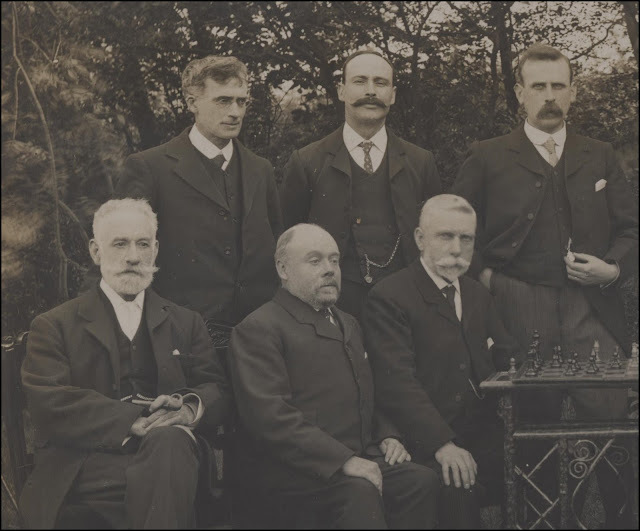 I do not recognise any of the twelve well dressed men in this photograph taken around 1900. The picture was purchased in Norfolk, England and I would be interested if any of the men can be identified. This is a tinted copy of the well known engraving published in The Graphic on 17th July 1886, and I do recognise some of these. 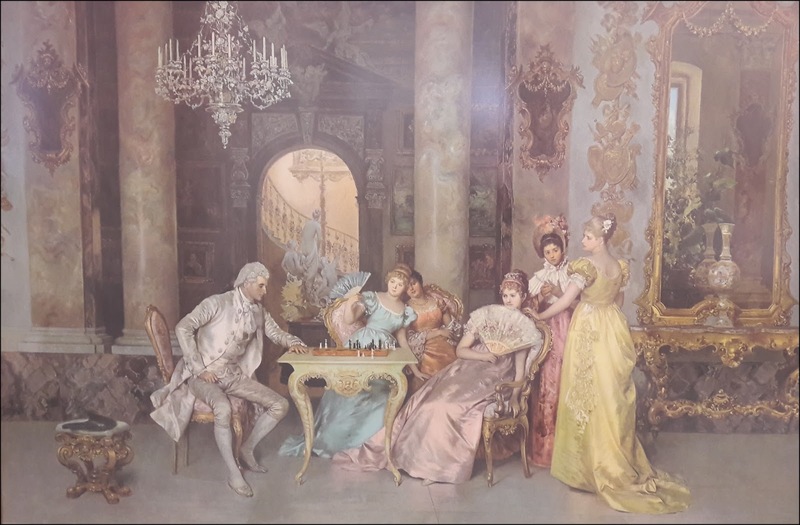 This is a large 90cm. 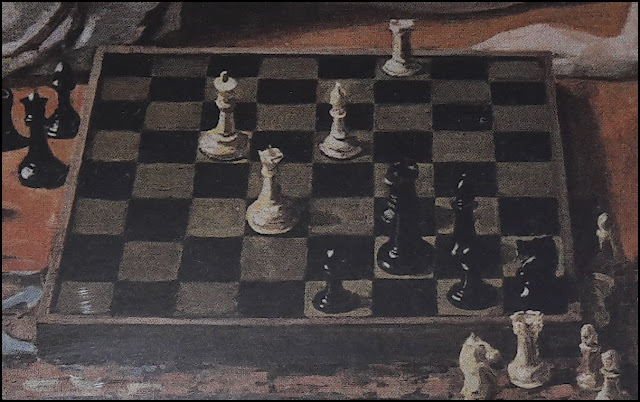 x 60cm. print of a beautiful painting by the Italian artist Francesco Beda. 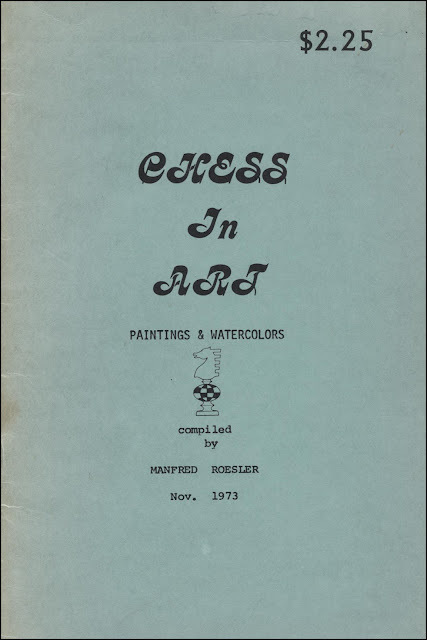 This painting is recorded in Chess in Art compiled by Manfred Roesler, Davenport, Iowa 1973. 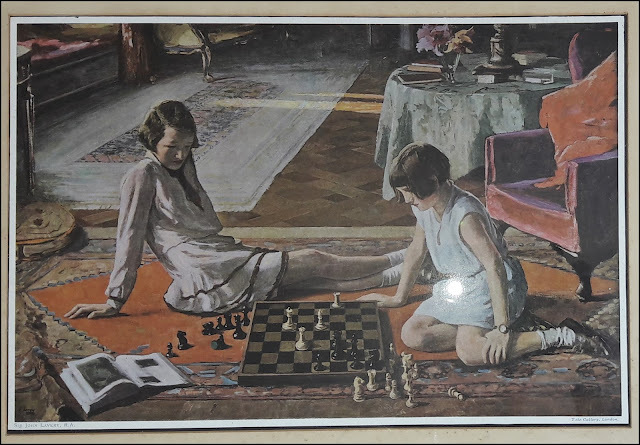 A print of Sir John Lavery's 1929 painting which is in the Tate Gallery. 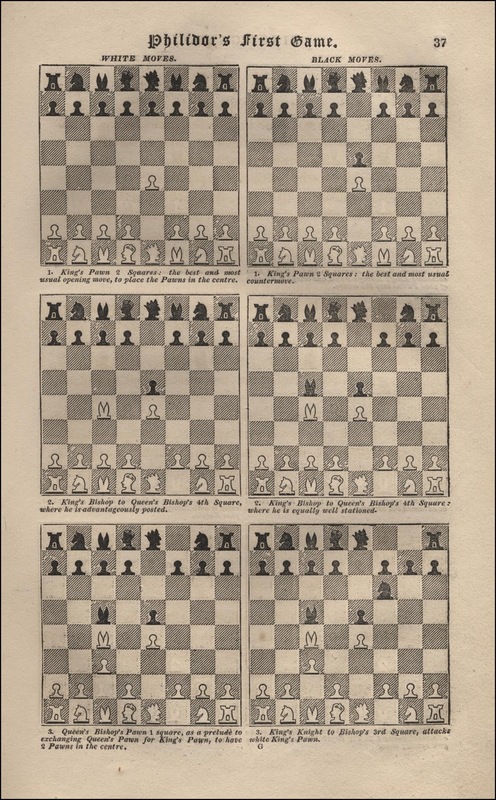 This is number 146 in Chess in Art. 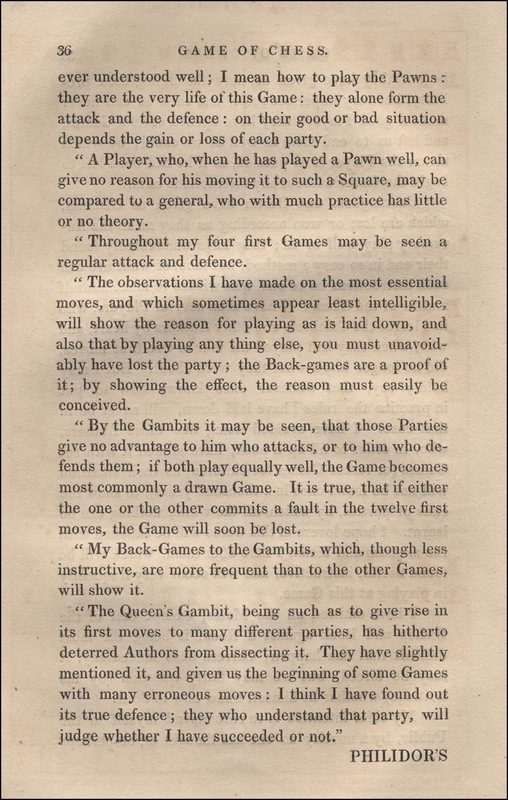 There were many Philidorian texts published following the death of the great player in 1795, but perhaps the most extraordinary is Chess Rendered Familiar by Tabular Demonstrations of the Various Positions and Movements as described by Philidor: with many other Critical Situations and Moves, and a Concise Introduction to The Game, by J. G. Pohlman, London 1819. 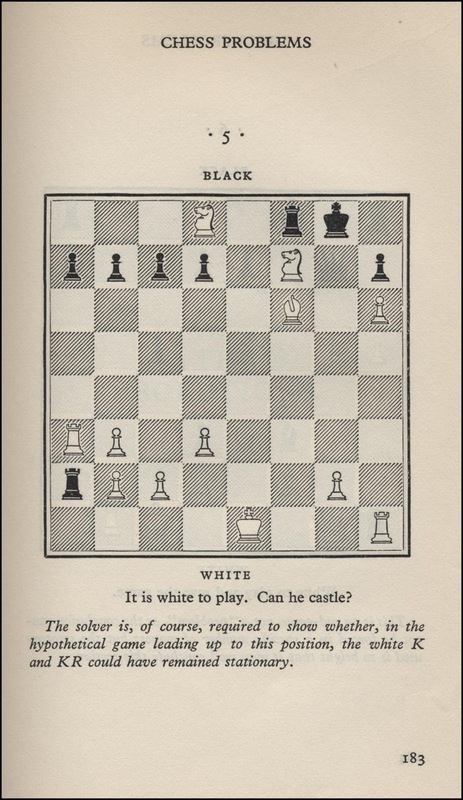 Mira. 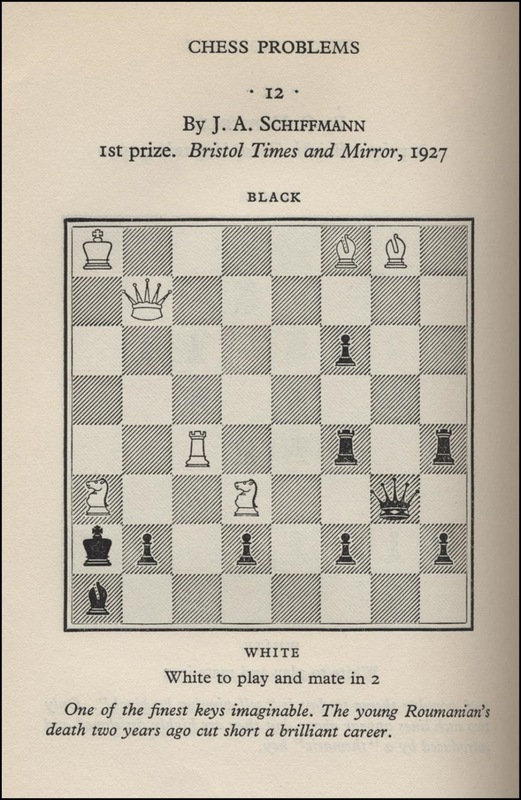 Sweet Lord you play me false. 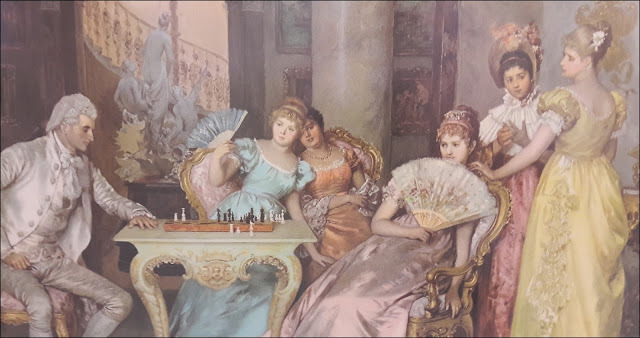 Fer. 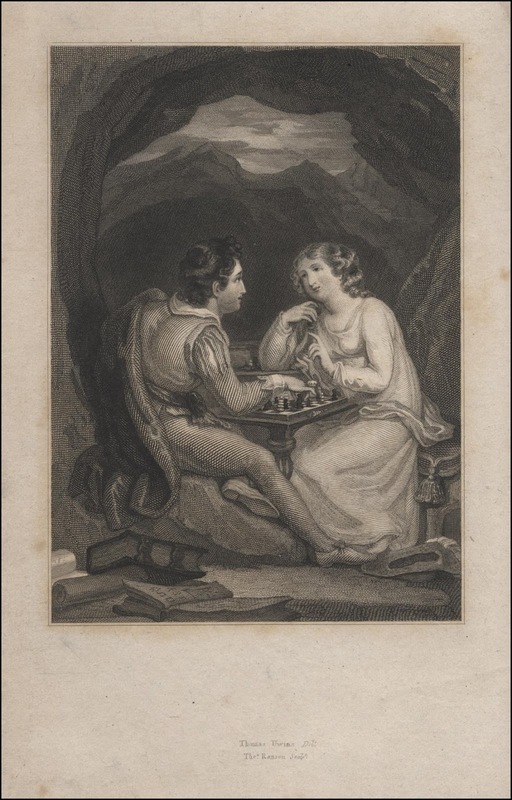 No my dear love. 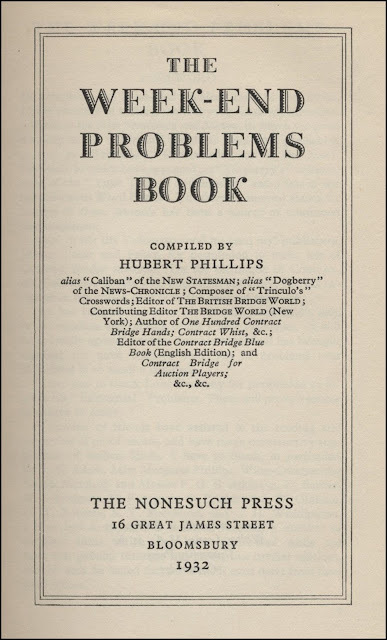 I would not for the world. 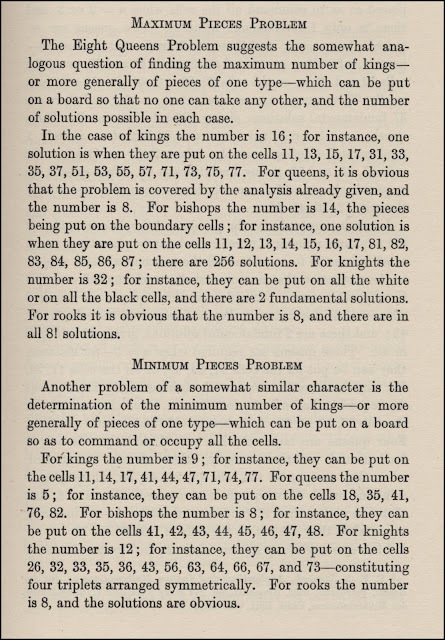 Only one of the twelve copies so far examined lacks these lines. This book includes 2,352 chess-board diagrams, six to a page, representing openings, and games from Philidor. 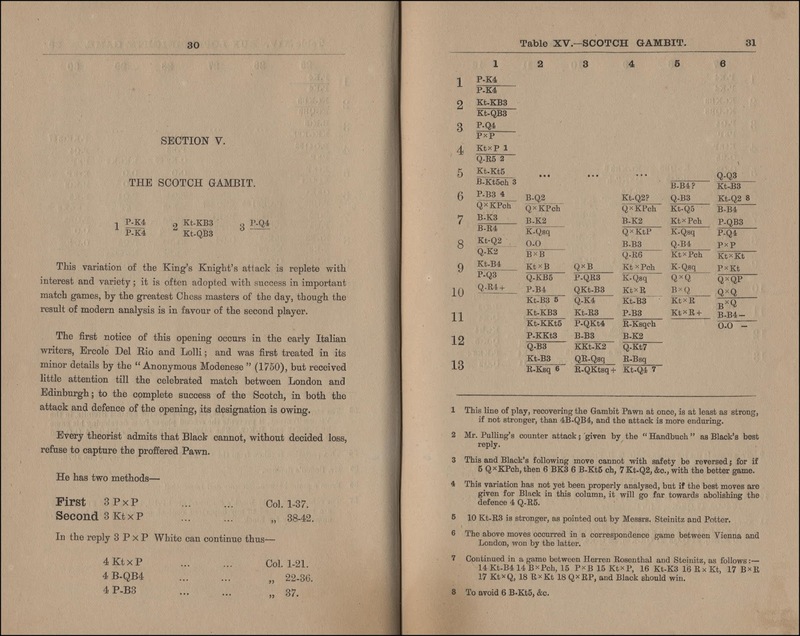 This was a remarkable feat of typesetting and printing. 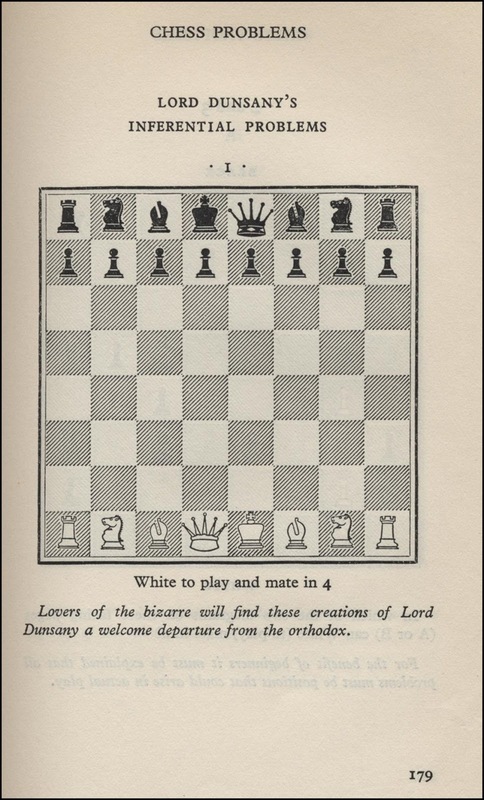 There is an unusual and interesting depiction of the king and queen in these diagrams, the queen definitely has a feminine appearance compared to the masculine king. 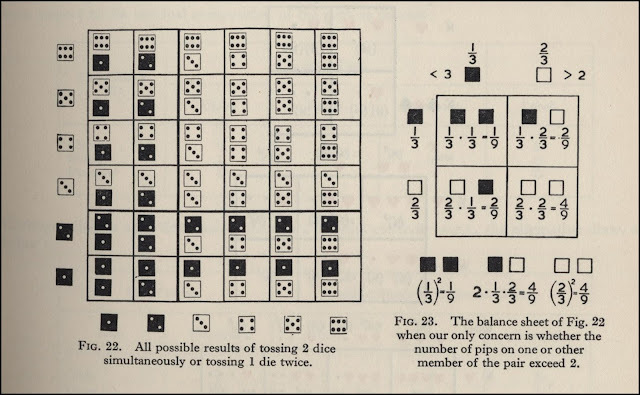 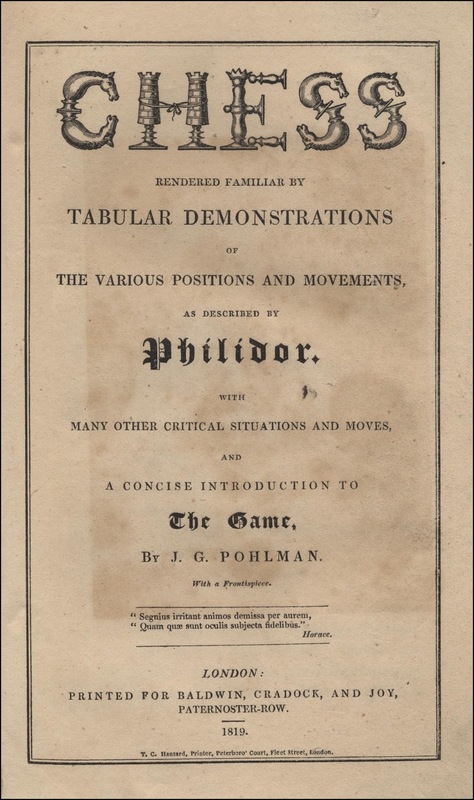 The essence of the -typically for the time- long-winded Preface is that Philidor's book was difficult and time consuming to follow, and that by presenting Philidor's games with a diagram for every move, the author has greatly facilitated the understanding of those games. 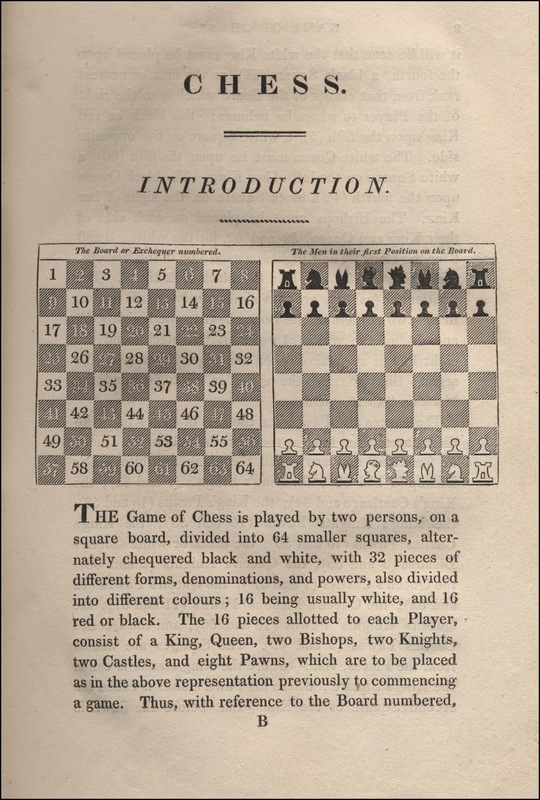 Pohlman's book commences with a thirty page Introduction to the Game of Chess which gives basic instructions, rules, maxims, and the laws of chess. 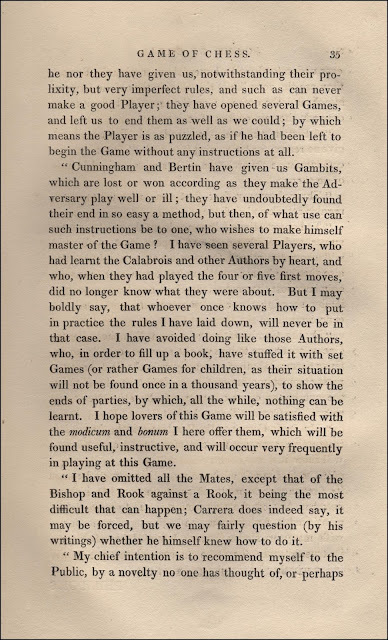 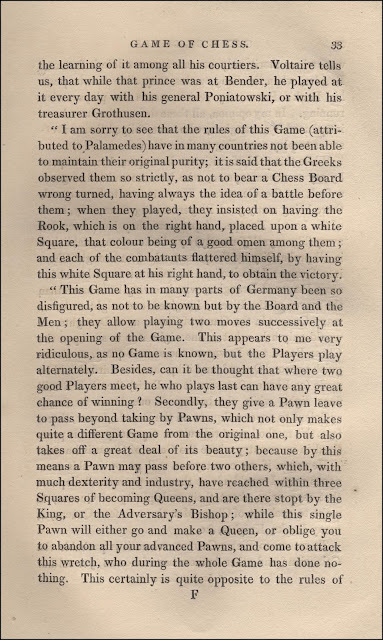 This Introduction seems to be a mixture of material taken from Peter Pratt's Studies of Chess and the anonymous An Easy Introduction to the Game of Chess, the 1816 edition of which was by the same publisher as Pohlman's book, Baldwin, Craddock, and Joy. 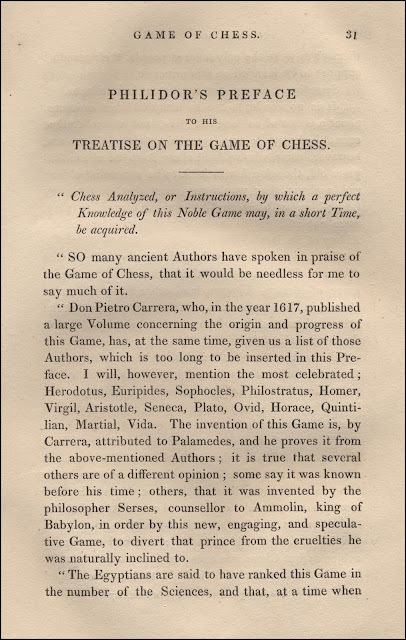 This is followed by Philidor's Preface to his Treatise on the Game of Chess giving the text from the first English edition of Chess Analysed published in London in 1750. 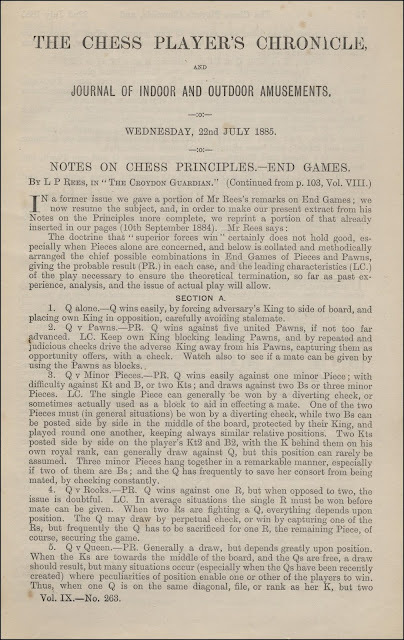 This Preface includes Philidor's frequently quoted remark regarding pawns; "they are the very life of this game", but he also touches on the equally important maxim that learning a few opening moves by rote leads nowhere in chess without an understanding of why the moves were made, and of the position arrived at. 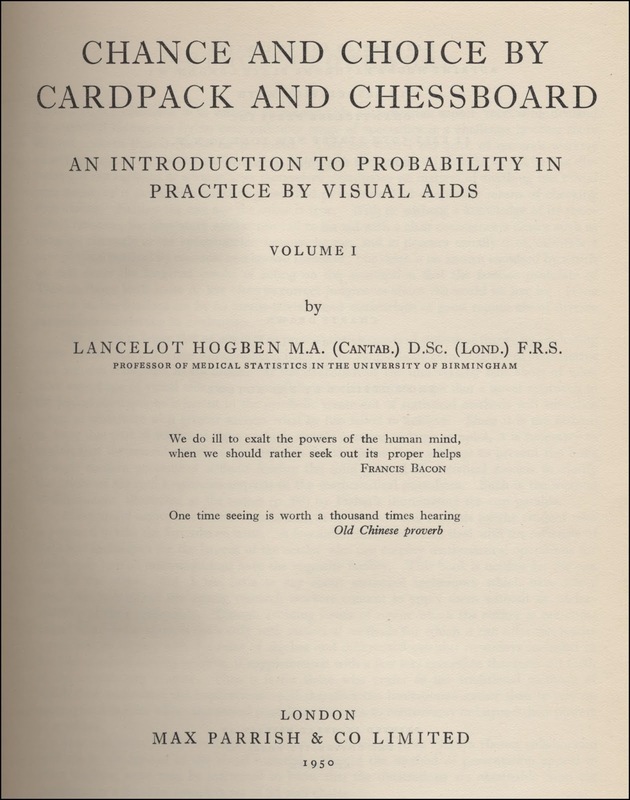 Then follows the 392 pages of chess-board diagrams. 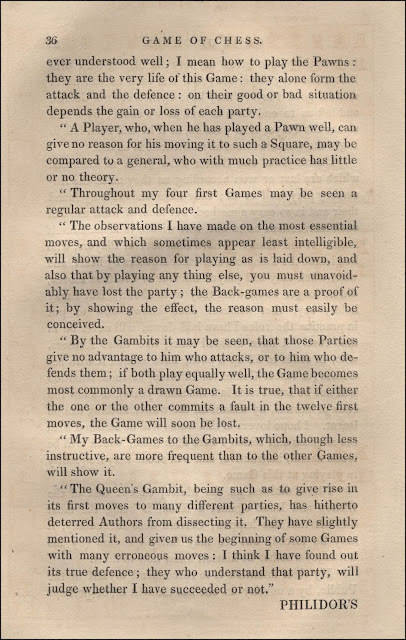 These represent, firstly the moves of the games, different mates and ends of games taken from Philidor's final work; Analysis of the Game of Chess, London 1790, with Philidor's notes to these games reworded and placed at the end. 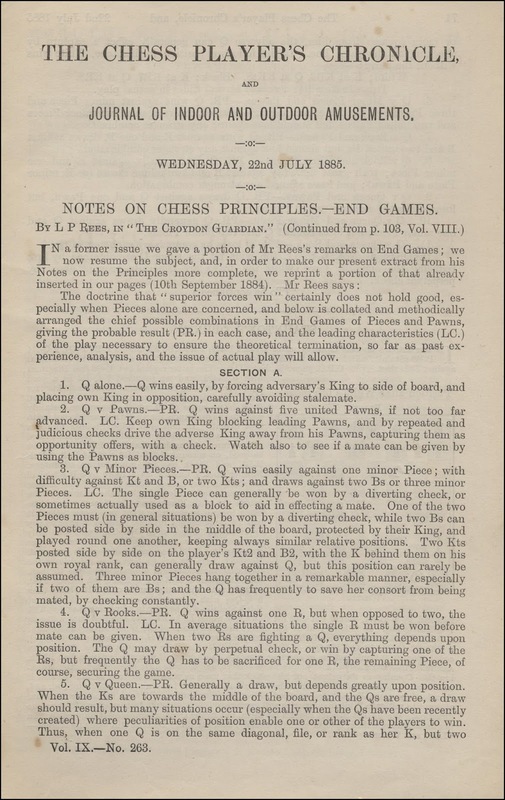 Secondly, eight games played by Philidor without sight of the board, and one other, and thirdly, Critical Situations and Moves taken from Stamma. There is very little information to be found on Pohlman; major libraries name him as John George Pohlman but he is not mentioned in any of the usual chess reference works. 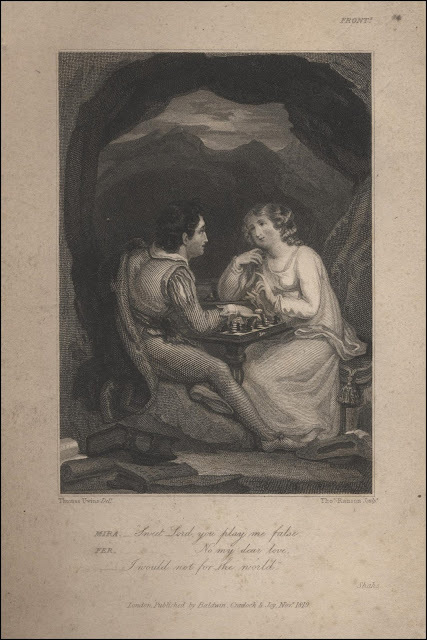 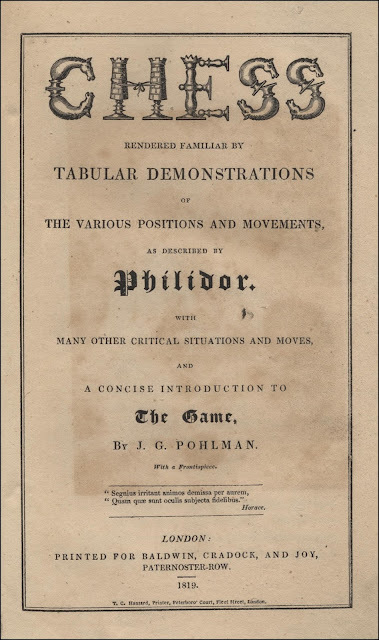 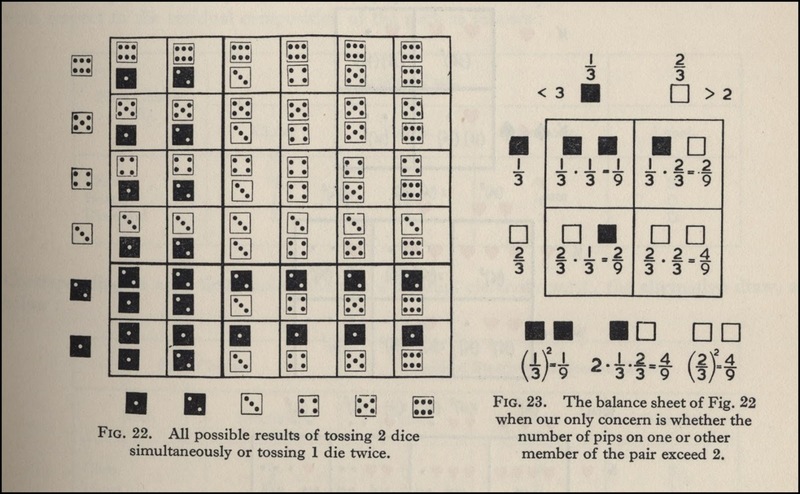 Pohlman published works on other games including Whist Rendered Familiar, London 1821 and 1827, A Practical Treatise on the Game of Draughts, London 1819, The Game of Draughts, London 1823 and The Polish Game of Draughts, London 1811 and 1815. 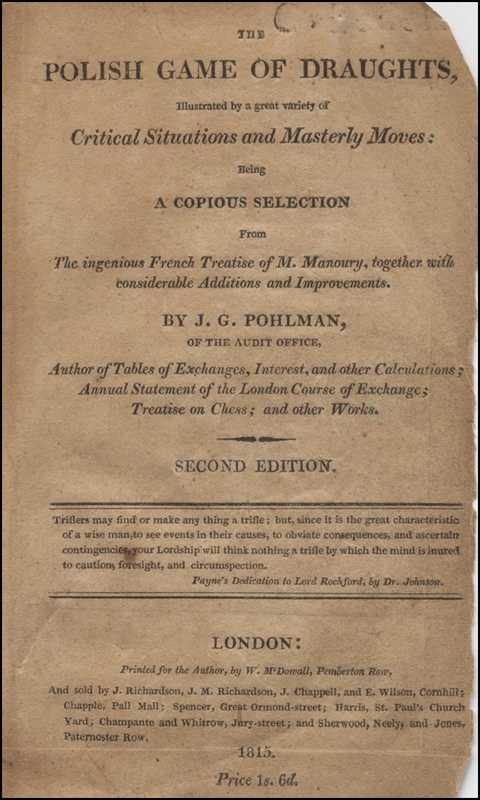 The title page of the latter work states that Pohlman was employed by the Audit Office and was the author of Tables of Exchanges, Interest and other Calculations, and the Annual Statement of the London Course of Exchange. 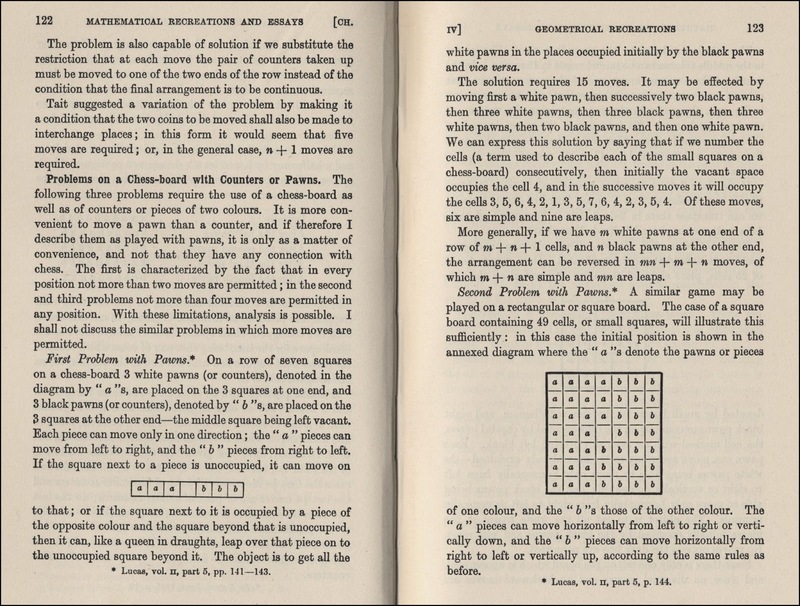 He also wrote other works of an arithmetical/financial nature. Pohlman begins the Preface to this work as follows; "The Translator, during his travels and residence on the Continent, had frequent opportunities of seeing the Polish Game of Draughts admirably played, and everywhere preferred to the common game...."
How successful Pohlman's Philidorian book was is difficult to say, there were no subsequent editions and his format of a diagram per move was not repeated for many years. Will H. Lyons was already describing the book as scarce in the 1890's and the fact that this book is not recorded in some early bibliographies indicates that only a small number were sold and that it was not widely known. Chess Rendered Familiar is not recorded, for example, in John Cochrane's Catalogue of Writers on the Game of Chess, published with his Treatise in 1822, nor is it listed in the Bibliographie Chronologique des Éditions Publiées de L'Analyse de Philidor on pages 300 to 306 of C. Sanson's Analyse du Jeu des Échecs par A. D. Philidor, Paris 1871, which lists 65 editions of Philidor from 1749 to 1870. 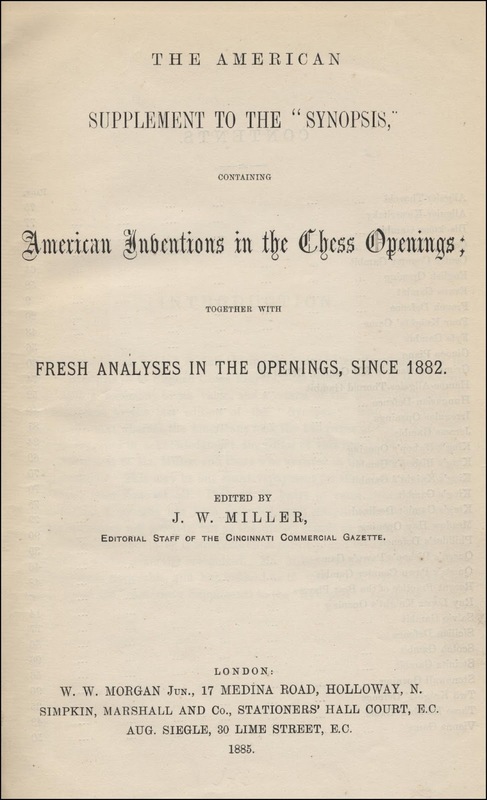 The American Supplement to the "Synopsis," containing American Inventions in the Chess Openings; Together with Fresh Analyses in the Openings, since 1882, edited by Joseph W. Miller, London 1885. The "Synopsis" supplemented is the third edition of William Cook's Synopsis of the Chess Openings. A Tabulated Analysis, London 1882. 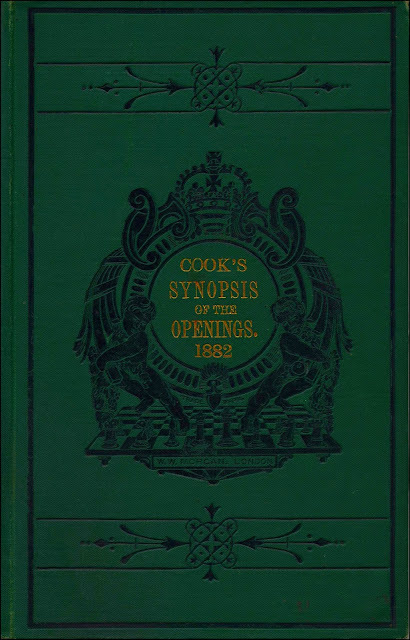 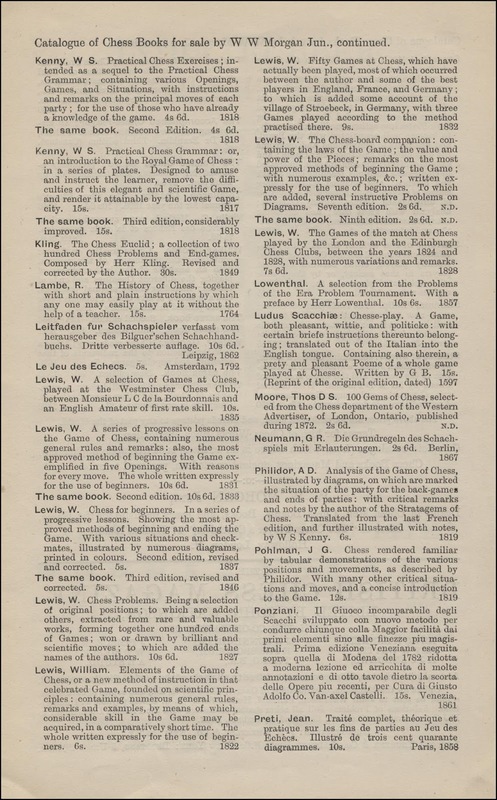 First published in 1875, Cook's Synopsis is a tabulated analysis of the openings with a short introduction to each, including historical origins, and a columnar layout with notes; a format still utilised in more recent openings encyclopedias such as Modern Chess Openings, Batsford Chess Openings, Nunn's Chess Openings etc. 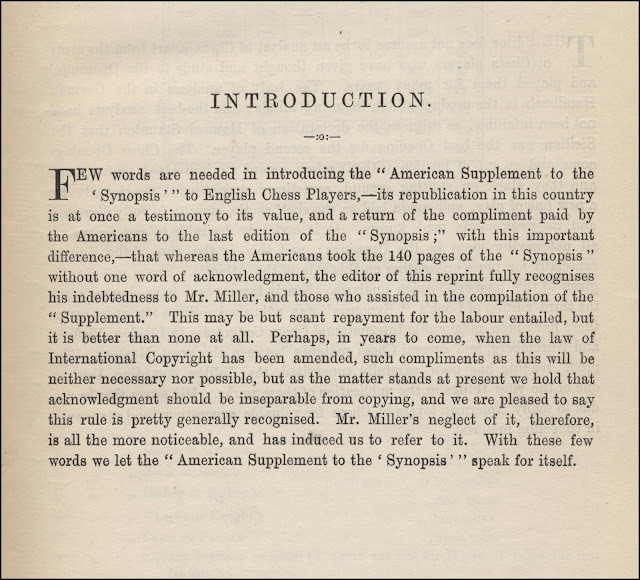 The American Supplement has a cryptically worded Introduction which I do not fully follow, but mainly appears to be a complaint about unacknowledged copying. 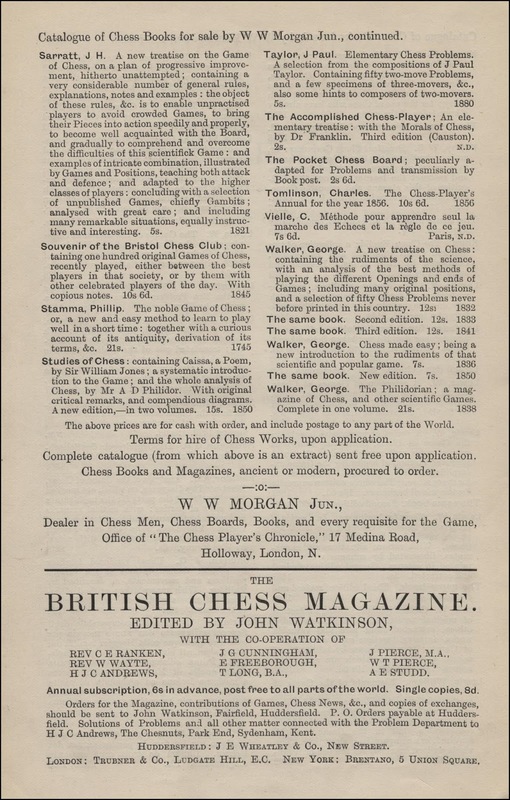 The publisher of The American Supplement was W. W. Morgan Jun., a major chess goods dealer at the time, and there are several adverts at the back for his wares. 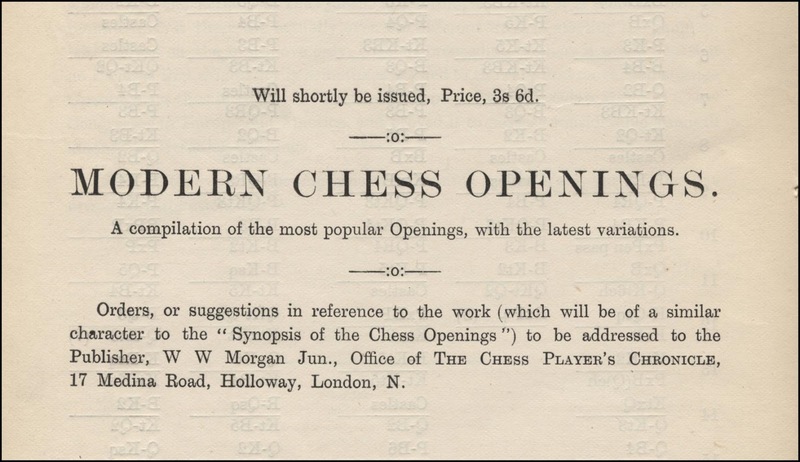 The first advert on the verso of page 91 is for a proposed book with the title Modern Chess Openings. 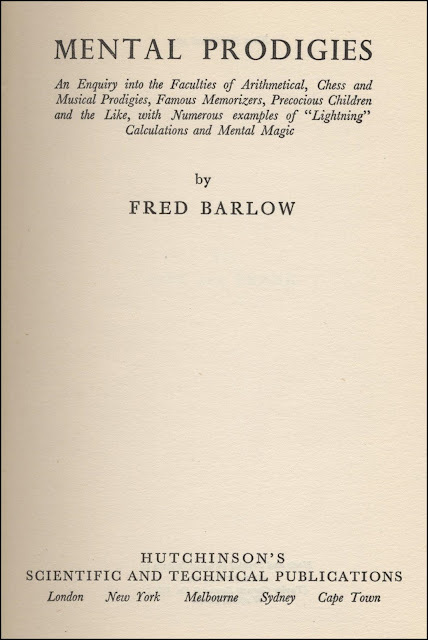 However, this was never published and that title was eventually taken by R. C. Griffiths and J. H. White for their 1911 book, and many later editions. 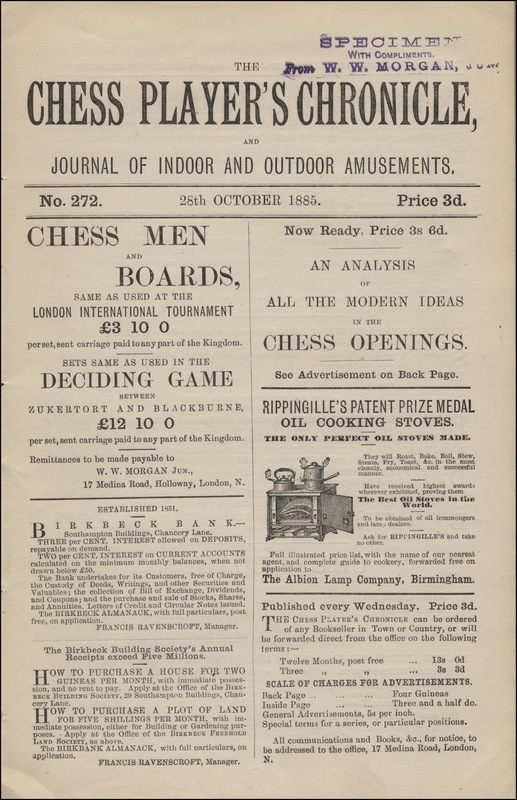 The advert section also includes a three page Catalogue of Books on the Game of Chess offered for sale by W. W. Morgan Jun. 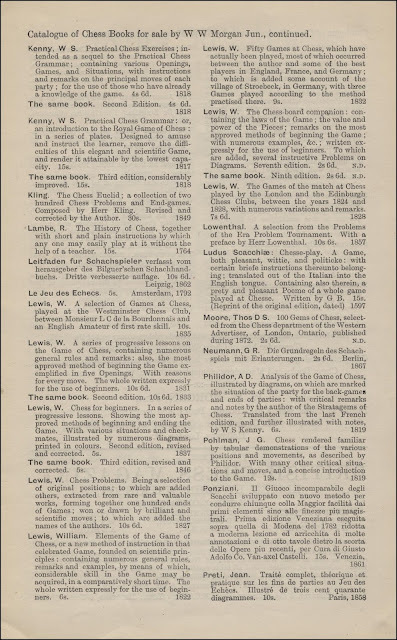 and this lists many interesting and scarce works from the 18th and 19th centuries. However, perhaps the most important part of the whole book, to chess bibliophiles, is the specimen issue of The Chess Player's Chronicle bound in at the end of each book. 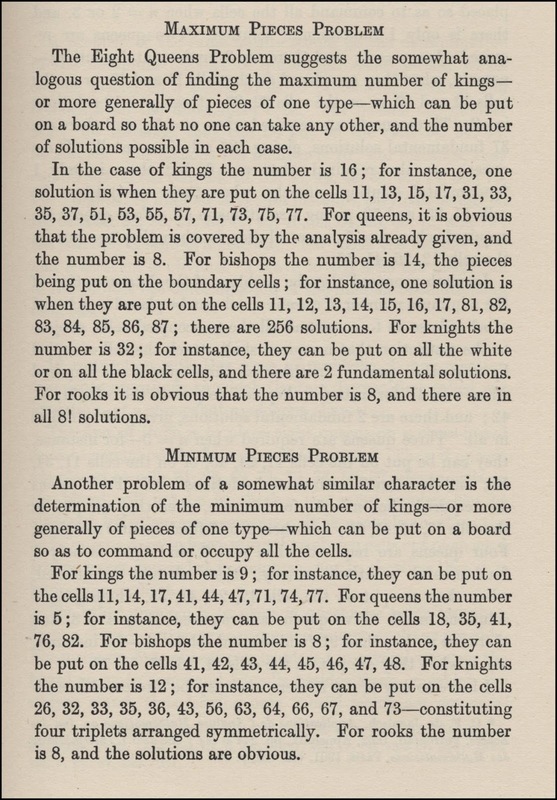 W. W. Morgan Jun. 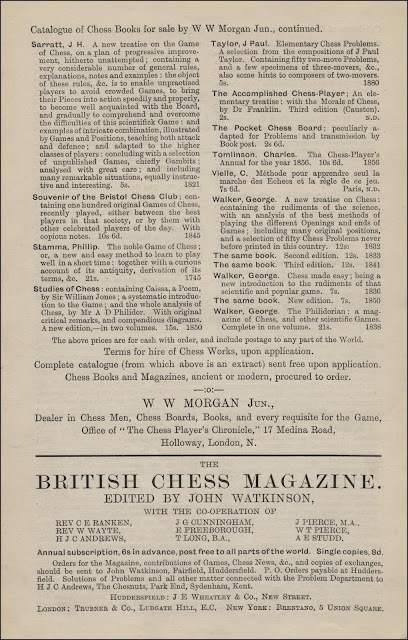 was the proprietor and publisher of The Chess Player's Chronicle at the time and he promoted his magazine by including a recent 12 page (plus covers) weekly issue with each American Supplement. 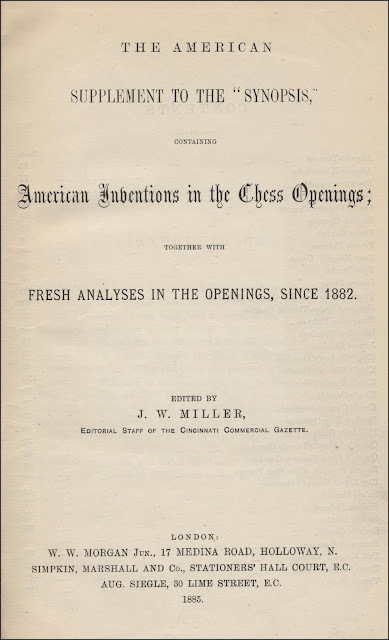 I have three copies of The American Supplement and each has a different issue of The Chess Player's Chronicle for 1885 which is a very scarce periodical in its original form. 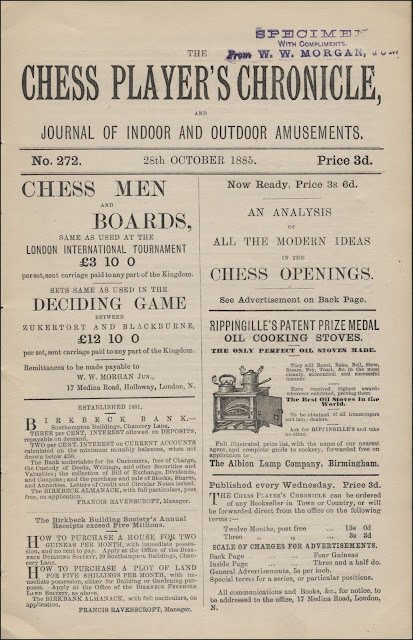 The full title of this periodical from 1881 to 1889 was The Chess Player's Chronicle and Journal of Indoor and Outdoor Amusements, however, my three copies have chess content only. Each issue has a list of books for sale by W.W. Morgan Jun. 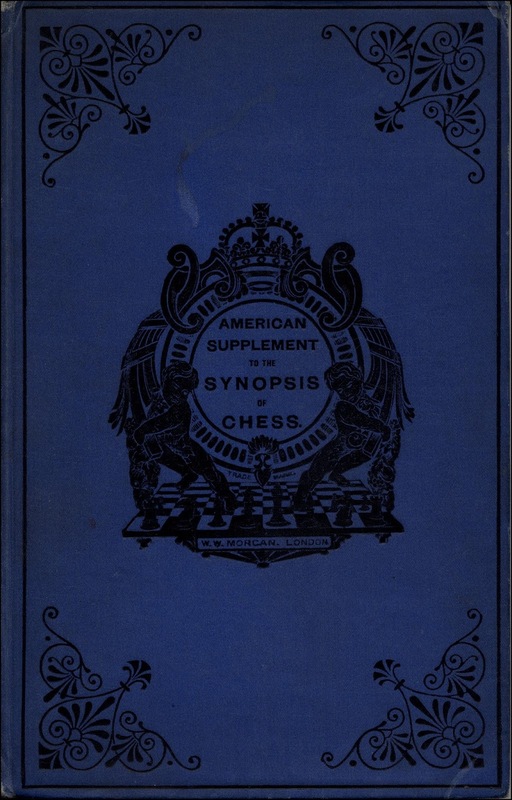 The American Supplement is not a particularly scarce book but, extraordinarily, I cannot see this in the Cleveland Public Library catalogue; surely they have this?